Kenya is more and more popular with foreign tourists – not surprisingly, if we look what the country has to offer. What are the top seven things to see and do in Kenya? Kenya maintains a well-managed system of national parks, who are among the finest of Africa. This has made Kenya the top safari destination in the world. Masai Mara and Amboseli National Park are the most popular wildlife resorts, and they draw in the tourist high seasons (July-August and December-January). 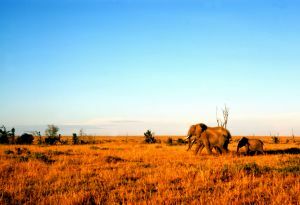 However, there are plenty of hidden gems for safaris left. My favorites are the impressive Mount Elgon National Park – the area around Africa’s third-biggest mountain – and the small but beautiful Saiwa Swamp National Park. Both attract few visitors but are of a breathtaking beauty and tranquility. Within Kenya, the coastal region stands apart. Arabs have frequented this part along the Indian Ocean since the 9th century, and this has led to the rise of the famous Swahili culture – the vibrant mix of African, Arab and Indian cultures. Many people are Muslim here, although of a liberal type. If you have the chance, watch a Taarab performance, seductive African-Arab-Indian music played at weddings and other festivities. And of course, Kenya has 500 kilometers of white sand beaches with excellent and affordable beach resorts, where you can dine and sip Martinis right at your private beach. Especially the Masai, Samburu and Turkana peoples still live a traditional, tribal lifestyle. It’s possible to visit their villages and do a tea drinking ceremony or watch traditional dances. However, ask a travel guide to direct you to a good opportunity, as too much of tourist visits turn into demoralizing high-pressure sales events. Perhaps the best of all Kenya travel tips. Each year in September-October, between half to one million Wildebeest suddenly gather on the Serengeti plains in Tanzania, after which they trek in a big circle through the south of Kenya and back again. It’s one of the biggest wildlife shows on earth. Some lodges are strategically placed so you’ll be right in the middle of it. Short hot air balloon trips over one of the major wildlife resorts – especially Masai Mara – have become increasingly popular. They typically leave very early in the morning so you’ll spend the first hours after sunrise gliding over the Kenyan plains, which is the best time for animal watching. There’s breakfast with champagne after landing. Priced around $400, they aren’t cheap, however. Who’s afraid of big bad Nairobi? It doesn’t have the best reputation, but actually I like Nairobi, and if you take some common sense precautions, nothing unpleasant is likely to happen to you. Nairobi is a really cosmopolitan place, where Africans and whites of all nationalities gather. My favorite places include Simmers, for a late breakfast with good coffee and newspapers, and the New Florida nightclub (nicknamed “Madhouse”), which indeed is a pretty crazy place in the early hours… And just outside Nairobi is the huge Nairobi National Park, making Nairobi one of the few world capitals where you can be in the middle of the wild bush with a 30-minute taxi ride from the city center. Kenya has great possibilities for diving and snorkeling, even by professional standards. The reefs at Watamu National Park along the coast are in an excellent condition. There are many of very exotic fish, in every color and shape conceivable. Fishers are totally banned from the waters, so you’ll not be disturbed. Even harmless whale sharks visit the waters regularly, a highlight for any diver. With this list of Kenya travel tips, I still haven’t mentioned trekking the permanently iced Mount Kenya, the huge pink flamingo population of Lake Nakuru, the coastal city of Mombasa with it’s ancient fortress, the paradise island of Lamu, the dhow races, and much more.